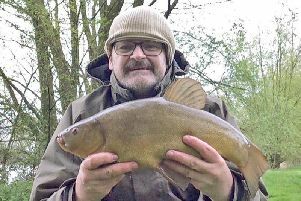 Brown fish really came out to play this week – especially on Furzton – as MK basked in glorious Bank Holiday sunshine. There were smiles aplenty as 20s popped out like corks from bottles, with some pushing towards the 30 mark. Leading the big-smile stakes were Lou Smith and Martin Kingston who, Thursday night to Saturday morning, shared 22 runs, landing 19 fish – Lou getting a 27-1 common PB and Martin a 24lb mirror PB. Nathan Grant, in his own words, had "A cracking day on Furzton," landing three fish – two going 21lb and 21-14. Ben Hislop celebrated an end to two years away from the bank with three chunky Furzton carp on his first outing – and Michal Majcher was well pleased with a fin-perfect 21lb common. 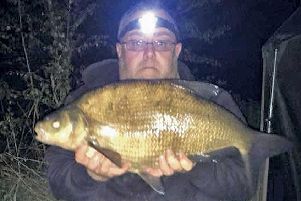 And Mitchell Ridgeway found himself dealing with double runs as he made a multi-fish catch, while Toni Richards bagged some nice fish at Wolverton Mill. On a different front, Tomas Zniebrzdowski landed a nice double-figure Emberton Park pike. ALDERS: John Beesley 189lb, Pete Archer 176lb, Colin Kidd 101. TOVE Valley, Lakeside: Rob Dzialak 88-8, Shaun Smart 82-4, Terry Davis 78-12. MK Vets, Linford pits: Richard Lattimer 20-14 (Black Horse) with Martin Cunniff and Bob Gale getting 17-13 and 17-3 (Heron). BLACK Horse Central stormed MK's canal spring league second-round cashing in on the Mill Road/Manorfields skimmers and silvers with two section firsts and two thirds for 36 points, with Browning Northampton on 33 and Lakes Lane Lads 31 – leaving 'Northampton top of the league on 63 at the halfway mark. 'Horse's Carl Smith won on 12-2 with team-mate Shaun Taylor third (10-2) as 'Lads' Dave Tebbutt made second with 10-8. MILL Pond, Husborne Crawley: Nigel Bass 4-2, Steve Chilton 1-3, Steve Davis 1lb. TOWCESTER/Nene, Heyford canal: Bream dominated a fair sprinkling of small silvers. Dave Brench won with 18-5 ahead of John Balhatchett 12-2 and Dave Gibbins 10-6. IT's quite common this time of year to see small quantities of dead fish, usually small silvers, floating in windward margins. Usually its a combination of natural factors and a sad fact of life. If you do, please call the EA on 0800 807060 in case it is something more serious.